Implanted Beacon transponders are indicated for permanent implantation in the prostate , and the periprostatic-tissue (i.e., prostatic bed) to align and monitor the treatment isocenter in real time during radiation therapy. Surface Beacon transponders are indicated for temporary external placement on the skin, to monitor respiratory motion, and other patient motion in real time during radiation therapy. Tracking accuracy, setup accuracy, and precision at any point in a treatment or setup is computed as the magnitude (length) of the average error vector over 300 valid target positions for a three beacon plan or 200 valid target positions for a two beacon plan. There are three independent rotations (Rx (pitch), Ry (roll), and Rz (yaw)) around the Optical Localization Subsystem frame axes (Xol, Yol, and Zol), respectively. The Calypso System has five main components:  Beacon transponders, the console, the electromagnetic array, the optical system, and the tracking station. Beacon transponders [Figure 1], three in number, are used as permanent or surface transponders in or near the treatment target as fiducial markers during radiation therapy. Each Beacon transponder consists of a sealed glass capsule containing a miniature electrical circuit measuring 1.85 mm in diameter and 8.0-8.7 mm in length. They do not have internal energy source and are passive. Transponders emit signals when excited by the non-ionizing electromagnetic field generated by the system's array. Each transponder emits a response signal at a unique frequency specific to that transponder which can be detected by sensors within the array. The system then interprets the shape of the transponder signal measured across the array to determine the position of each transponder. The Calypso System console [Figure 2] is a movable unit contains the system components that generate and detect the electromagnetic signals used for patient alignment and continuous monitoring of target position. The console contains electronic power supply, system control components, computer with Calypso System software, and a touch screen display. Calypso System software provides graphics and numerical data for performing quality assurance and calibration procedures for positioning the array and the patient. The array is a flat panel [Figure 2], which contains the electronic components that enable the Calypso System to excite the Beacon transponders and estimate their position from the transponders signals. The array is positioned over the patient during patient setup and remains in place during radiation treatment to track the motion of the treatment target relative to the machine isocenter. Optical targets in the array can communicate with the optical system to determine the array position with respect to the machine isocenter. The array is designed to be left in position during treatment. The optical system [Figure 2] is equipped with infrared cameras permanently mounted on the ceiling of the treatment room, a power supply and a hub unit. This system is connected to the tracking station in the control room via Ethernet. The optical system continuously monitors the optical targets embedded in the top of the array to determine the position of the array relative to the machine isocenter. As long as five of the nine optical targets are visible to two of the three cameras, the system has adequate data to calculate the array's position continuously. The optical system is calibrated to the isocenter of the linear accelerator. Tracking station  is located in the control room connected to optical system and console in the treatment room through Ethernet. Data continuously stream between the console and the tracking station to track the target position relative to the machine isocenter. Target position information is presented to the radiation therapist using simple and objective on-screen graphics, numerical data, and auditory indicators when the target moves outside of predefined limits for target motion. Before system is used a QA procedure was performed daily to ensure proper operation of the Calypso System. QA fixture phantom [Figure 3] and the Calypso fixture stabilizer tools were used. The QA fixture is a block containing three Beacon transponders rests on three thumbwheels that allows adjusting the fixture's height. It has Scribe lines on 3 vertical sides and the top to permit alignment with the lasers in the treatment room. This procedure is used to verify the system performance using Beacon transponders and to identify the changes in calibration or system accuracy. Carbon fiber table top was removed by Calypso kVue™ Couch top. QA was selected in the console computer. QA fixture was placed on the treatment table at isocenter. QA fixture level was adjusted with the help of thumbwheel feet and also table height was adjusted to align the lasers with the target lines on the QA fixture. Array is positioned within the acceptable limits from QA fixture. The screen continuously updates numerical and graphical position indicators that display the direction and distance the array should be moved or rotated, relative to the fixed position of the machine isocenter. D: Distance between QA fixture isocenter to Calypso System isocenter. X QA , Y QA , and Z QA are the distances of the QA fixture's isocenter from the calibrated Calypso System isocenter in the X, Y, and Z axes, respectively. Camera calibration was performed only if system calibration fails. 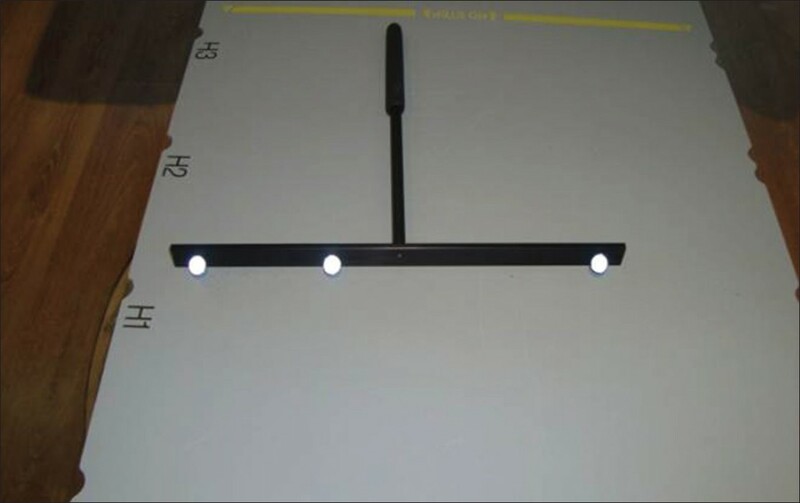 The tools that were used were two fixtures, the L-Frame fixture [Figure 4] and the T-Frame fixture [Figure 5]. The L-Frame fixture is shaped like an L and has four spherical optical reflectors. This fixture is also used to calibrate the system cameras. 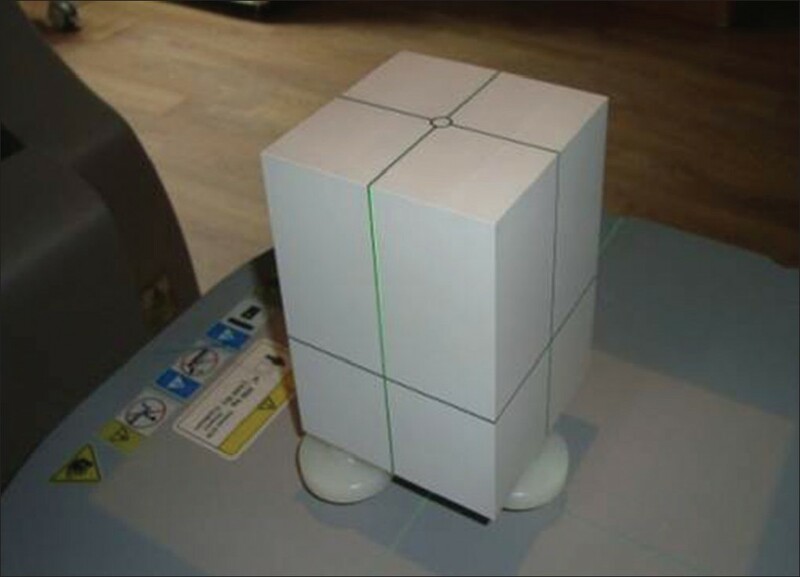 L-frame calibration fixture was placed on top surface of the table such that fixtures corner reflector was as close as possible to isocenter and other reflectors on their respective laser planes. The four reflectors were correctly detected by the optical targets on the L-Frame fixture by the infrared cameras. When less than four light sources were detected reflective objects from the camera view were uncovered if it exists and L-Frame position was adjusted. In case of more light sources, unnecessary reflective objects were blocked. With the help of software, test was done which showed the camera calibration result as either pass or fail. Table was positioned such that it is out of view of the cameras (in the lowest vertical position and away from the gantry in the longitudinal direction). Gantry rotated to 180°. Optical field of view was defined by moving the T-Frame fixture [Figure 5] throughout the field of view using a small circular motion. The T-Frame fixture is shaped like a T and has three spherical optical reflectors on its cross-bar and a cushioned handle. The field of view is a cube with it center 14 cm above isocenter. This process was done in three positions spending equal amount of time in each position. In the first position, target bar was horizontal and the handle is parallel to the table top. In the second position, target bar is vertical and the handle is tilted approximately 30° in clockwise. In the third position, target bar is vertical and the handle is tilted approximately 60° in anti-clockwise direction. The reflective sphere was facing the wall opposite the Linear accelerator (LINAC). The software system evaluated the data that was collected. During calibration process, the three camera images were observed that each camera is detecting the T-Frame fixture optical targets uniformly throughout the optical field of view. It is visible as an increasing volume of dots. When each camera image displays uniform coverage, test result is shown as pass. In this Calypso System, coordinate reference frame is calibrated to the machine isocenter using the isocenter fixture [Figure 6]. It contains three Beacon transponders and has scribe lines on three vertical sides and the top for alignment with the lasers in the treatment room. In addition, the fixture has six optical reflectors, and three thumbwheels for adjusting the fixture's height. The fixture also contains an internal tungsten ball positioned at isocenter that may be used for image verification of the fixture position. Isocenter fixture was placed on the treatment table at isocenter. Fixture level was adjusted with the help of thumbwheels and also table height was adjusted to align the lasers with the target lines on the isocenter fixture. Anterior and lateral orthogonal films were taken with calibration fixture. Position of the isocenter was evaluated with respected to LINAC isocenter. Fixture was moved towards isocenter when the offset position of the fixture is outside tolerance. Numbers of optical targets in each camera were counted as three, six, and three in camera 1, camera 2, and camera 3, respectively. With the help of software testing was started which took less than 1 minute and showed that the isocenter offset result was either pass or fail. If the test result is fail, fixture was repositioned. This test defines the coordinate reference frame of the optical system by aligning the Calypso System coordinate reference frame with the machine isocenter. D is the Isocenter Offset which is the distance (offset) of the measured position of the isocenter, fixture isocenter from the machine isocenter position. It must be less than or equal to 0.1 cm for the test to pass. X C , YC, and Z C are the distances of the fixture's isocenter from the calibrated Calypso System isocenter in the X, Y, and Z axes, respectively. The calibrated Calypso System isocenter was defined at 0, 0, 0. Calypso System is used for both localization (alignment of the treatment target with the machine isocenter before radiation treatment delivery) and tracking (continuous monitoring of this alignment during radiation treatment delivery) of target. In localize, only technique Calypso System is used only for localization. These patients have treatment targets that are too deep to permit tracking during treatment because there is inadequate clearance between the array and the linear accelerator gantry. However, they still benefit from accurate and objective initial alignment. In system accuracy QA, the detected positions of the fixture with respect to calibrated Calypso System isocenter in lateral, longitudinal, and in vertical directions were −0.12 cm, −0.15 cm, and 0.00 cm, respectively. From the above data, the derived distance between QA fixture isocenter to Calypso System isocenter (isocenter offset) was extremely small with sub millimeter precision of 0.02 cm. 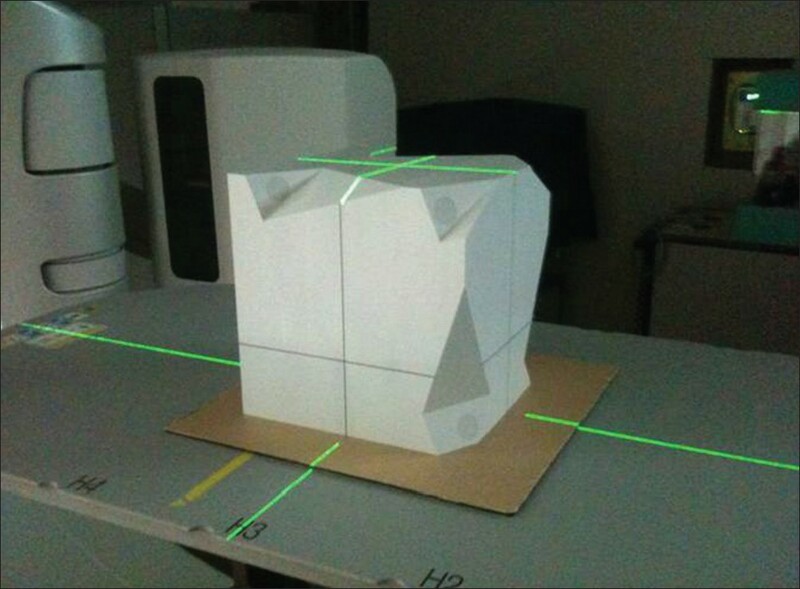 The test result was passed in all the cases (block of reflective objects, exposing optical targets without any uncover) by proper positioning of L-Frame and exposing optical targets when four light sources were detected. During the camera calibration, T-Frame fixture optical targets were detected by each camera throughout the optical field of view which shows all tests were passed. Against the tolerance of 0.1 cm, the offsets that were observed in x, y, z directions were 0.02 cm, 0.02 cm, 0.01 cm and the derived isocenter offset was 0.03 cm observed in this test. This proved that the Calypso System coordinate reference frame was calibrated to the machine isocenter using the isocenter fixture with high precision accuracy of <0.02 cm. The setup accuracy, tracking accuracy and precision were measured in localization and tracking procedure and all the values that were obtained were within the limits with sub-millimeter accuracy [Table 1]. Patient positioning and localization by non-radiographic techniques become key components in the radiation therapy process. Quality assurance of these systems is needed, as only proper operation and use ensures that the planned dose distribution is actually delivered. These tests were found to be useful in detecting performance of the Calypso System that needs recalibration. 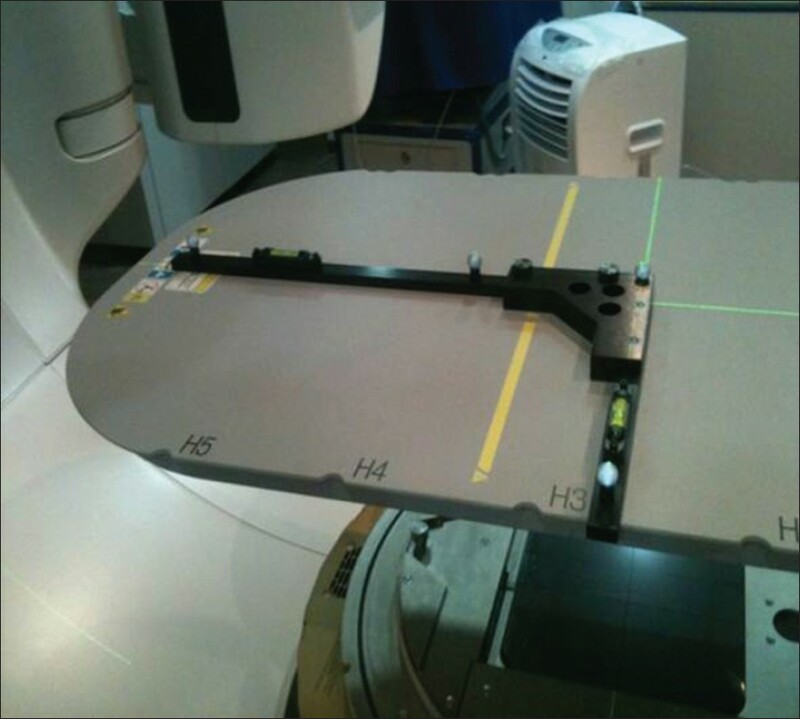 Use of these tests provide accurate, objective, and continuous localization of a treatment target for patient alignment and target position monitoring during radiation therapy to an accuracy of 0.01 cm. 1. Parikh P, Hubenschmidt J, Dimmer S, Vertatschitsch E, Eidens R, Low D. 4D verification of real-time accuracy of the Calypso System with lung cancer patient trajectory data. Int J Radiat Oncol Biol Phys 2005;63:S26-7. 2. Burch D, Willoughby T, Meeks S, Kupelian P, Litzenberg D, Sandler H, et al. Real time prostate translation, rotation, deformation evaluated with Calypso Beacon transponders. Int J Radiat Oncol Biol Phys 2005;63:S195. 3. Kupelian P, Willoughby T, Litzenberg D, Sandler H, Roach M, Levine L, et al. Clinical experience with the Calypso 4D localization system in prostate cancer patients: Implantation, tolerance, migration, localization and real time tracking. Int J Radiat Oncol Biol Phys 2005;63:S197. 4. Willoughby T, Kupelian P, Pouliot J, Shinohara K, Aubin M, Roach III M, et al. Target localization and real-time tracking using the calypso 4D localization system in patients with localized prostate cancer. Int J Radiat Oncol Biol Phys 2006;65:528-34. 5. Kupelian P, Willoughby T, Mahadevan A, Djemil T, Weinstein G, Jani S, et al. Multi-institutional clinical experience with the Calypso System in localization and continuous, real-time monitoring of the prostate gland during external radiotherapy. Int J Radiat Oncol Biol Phys 2007;67:1088-98. 6. Scott T. Efficiency and clinical workflow of delivering IMRT to the prostate within 2-mm tolerances. Int J Radiat Oncol Biol Phys 2009;75 (3 Suppl):S580. Abstract no. 2889. 7. Beyer D, Liu D, Flores N. Efficiency of a non-ionzing target localization system for radiation therapy. Int J Radiat Oncol Biol Phys 2006;66:S372. 8. Balter JM, Wright JN, Newell LJ, Friemel B, Dimmer S, Cheng Y, et al. 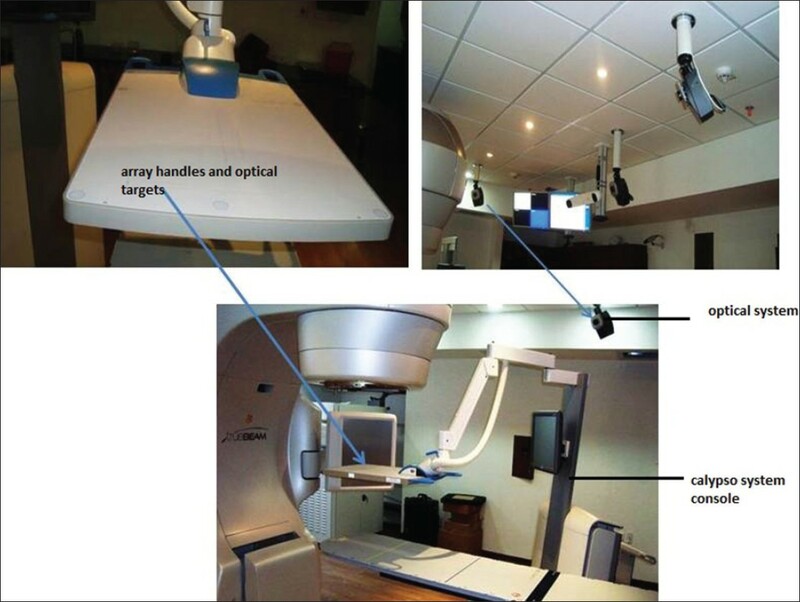 Accuracy of a wireless localization system for radiotherapy. Int J Radiat Oncol Biol Phys 2005;61:933-7. 9. International standard IEC 60601-1-8. Medical electrical equipment-Part 1-2: General requirements for basic safety and essential performance. Collateral standard: Electromagnetic compatibility-Requirements and tests. Geneva, Switzerland: International Electrotechnical Commission Publications;2003. 10. Calypso® System Version 2.0 User's Manual. Palo Alto, CA 94304, USA: Varian Medical Systems; 2012. 11. Santanama L, Noel C, Willoughby TR, Esthappan J, Mutic S, Klein EE, et al. Quality assurance for clinical implementation of an electromagnetic tracking system. Med Phys 2009;36:3477-86.